Woodturners love to turn burlwood because of its beautiful grain. Unfortunately burls can be very expensive. An alternative is utilizing tree scabs which occur when a tree loses a limb and then grows a scab over the wound to seal and protect. These scabs have very wild grain and occasionally burl. This demonstration will discuss several methods for mounting using either a screw drive or faceplate and how to reverse chuck utilizing a tenon or recession to produce a unique bowl. Our January demonstrator is Fred Denke. a retired engineer who spent 42 years in the aircraft industry. 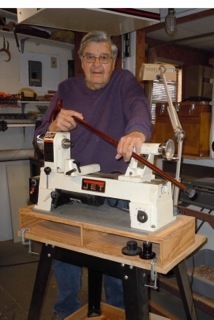 After retiring on January 1,1999 in a effort to fill his leisure time he purchased a wood turning lathe and has enjoyed the hobby or craft, whichever you prefer. Only a few tools are required for this project, it is a cross between using a pen mandrel and conventional spindle turning. The end product can be simple or if you are an experienced turner of beads and coves they can be added to the cane. This demo will only show a simple cane without beads or coves..